As part of my ongoing development of the TB6612FNG motor control board, I have created a laser cut Kapton soldermask stencil. In this post, I will first discuss the method of producing a stencil vector drawing from KiCAD. 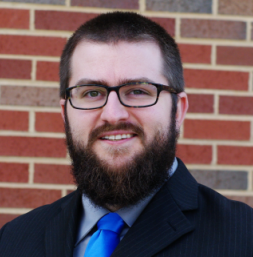 Next, I will discuss the issues that come up with improper settings when cutting Kapton. Finally, I will discuss the laser CNC settings required for cutting it properly. It is quite easy to generate the soldermask layer from KiCAD as a vector image. To do so, go to File->Plot and select the settings circled in the picture. The file needs to be saved as a DXF (a commonly accepted vector format). Don’t bother plotting anything besides the soldermask you need, the extras will just junk up your folder. 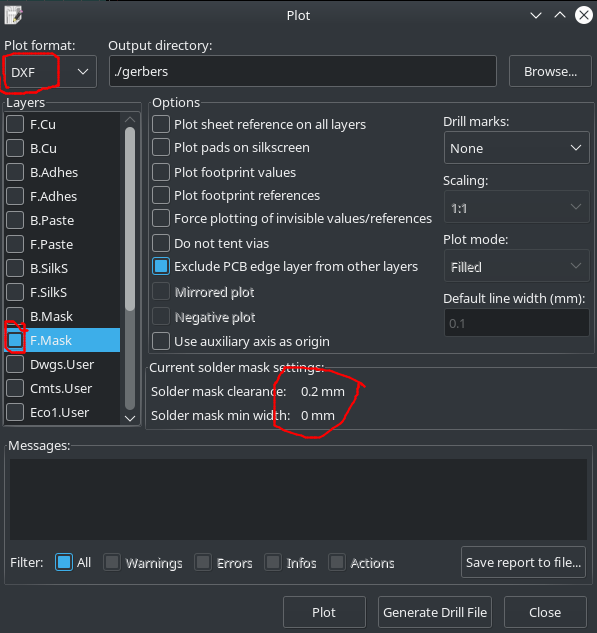 Before you plot the file, make sure that the soldermask settings are appropriate. The 0.02mm offset I use is great for this application. If you need to change your settings, you should do so in the design rules of your document. From there, you need to touch up the vector image. Open the DXF file you created in your favorite vector graphics tool. I prefer using LibreCAD, but the laser CNC I am using requires the use of Adobe Illustrator. The vectors must be colored pure red (#FF0000), and the line width set at 0.001 pt. Then, the file is sent by printer drivers to the CNC machine. Kapton is a fun little polymer to use. It starts out with a handsome orange color, and can be purchased on convenient rolls. Sadly, the very thin Kapton sheets required for making screens tends to curl after being on these rolls. Therefore, we need to flatten it. 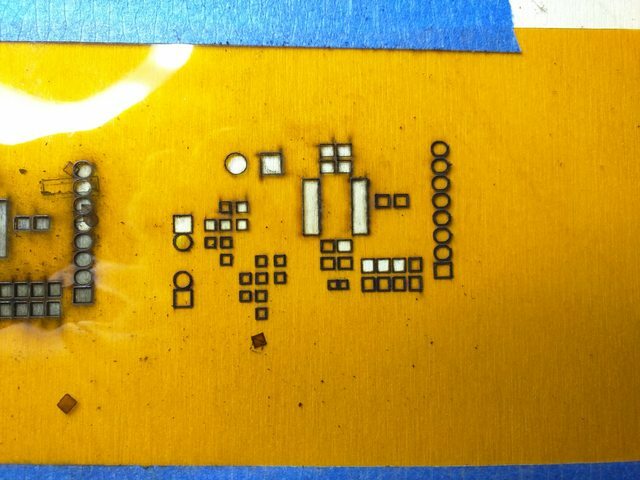 Additionally, placing the thin polymer on the metal bed of the laser CNC is unwise, as the heat from the laser ablating the metal could cause portions of the film to melt. To remedy this, I taped my Kapton to some scrap plywood. This changes how we use our material in the CNC. In an ideal world, we would just tell the machine how thick our material is, and it would adjust the settings appropriately. In reality, we need to work with the optics of the laser. The “material thickness” the machine asks us to enter is not true thickness. Rather, it wants to know the correct focal length for the laser to reduce kerf as much as possible. So even though I am using 0.1 mm thick Kapton, my Z-axis adjustment for thickness is ~4 mm. We would not want a laser cut Kapton soldermask that thick, it would apply too much solder. The result was ugly. The laser cut through the material vigorously. Edges of the Kapton are charred and curled. But is this good enough? 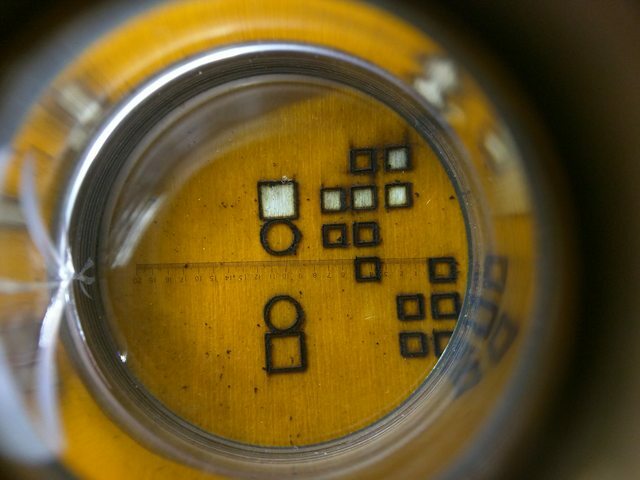 Taking a look through my 10x loupe, we can measure the size of the holes. The width of the rectangles in the following picture are exactly 1.778 mm in the vector file. Our measurement shows that the width of the cut holes are 2 mm. This is unacceptable. The initial result shows slightly less charring. In the picture, you can see the first cut to the left of the current one for comparison. But will it be enough? Looking through the loupe again, we inspect the feature size. Looking at the same feature as last time, we can see that the width of this rectangle is ~1.8 mm. This is close enough to the proper 1.778 mm that I cannot distinguish differences at this level of magnification. So we are good right? Wrong. Checking another feature, a problem becomes apparent. Two pads of a header have melted unacceptably close together. If we were to solder this part on, the traces might contact each other. Clearly, the localized melting is still an issue, if only for very closely spaced pads. I was very happy with this result. The Kapton was still obviously cut, but this time, few of the pieces fell away when I moved the sheet. I had to take a razor to individually pop out each pad. This might seem tedious for complicated boards, but I assure you that this is what we want. 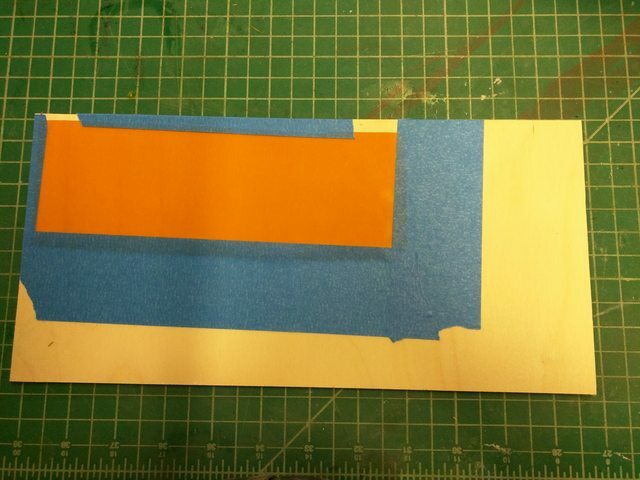 If the Kapton is just barely cut, the edges should be less deformed. When we look at the pads which had issues last time, things seem to have turned out better. There is a clear distinction between the traces. This means that we are more likely to have successful solder paste application. If you intend to make a laser cut Kapton soldermask, I strongly recommend to start with the low settings I have used on this trial.